Dearly cherished within our hearts. From far off, Autumn wind runs at us in a rush! Then past the cliff, through countless pines, like echoes fly. * "銜枚走" (hold in mouth/bear, trunk, walk) is hard to translate or make much sense in English. It has no overt reference to soldiers, battle, or night attack. The author,Yuan Xi, said that in old times when soldiers were launching an attack secretly, they usually held something in their mouth - and put something like a tree branch inside their horses' mouths - so that there would be no "unexpected" sound to betray their suprise attack. Xi said when the wind passed through the woods, it gave her a feeling of tension, secrecy, just like that of a secret attack in the night. "銜枚走" is easy to understand in Chinese, as in movies these scenes are often shown; but in English, people could find it hard to understand. So Xi agreed with the statement of a soldiers' secret attack. The timer measures; night moves on; pen; thought; late. Through sickness haze I badly brew some tea; some verses write. O withered, yellow flower not yet dead up to this date ? Over seventy summits, mapped and named, obscured by snow. Vastly high, to rising sky, lined up, a thousand passes! Battled armies halt: So huge their ride! How far to go!? Which immortals built those paths where only birds can fly? So high, so far away, yet reachable in just a day. Life-affirming, miracle pines peak over clouds’ seas’ sway. Brush pen flourished into Dream Flower Pen(4), a tree-soft point. Yellow Emperor(5) made dan inside this Taoist sphere. Full of beauty—is this Buddha’s lotus seat(6) spread here? Brightness Apex(7), it’s impossible to get to the point. Only being here I now know the universe’s light. 1. Huangshan: https://en.wikipedia.org/wiki/Huangshan(Chinese: 黄山, literal meaning: Yellow Mountain) is a mountain range in southern Anhui Province in eastern China. Vegetation on the range is thickest below 1,100 meters (3,600 ft), with trees growing up to the tree line at 1,800 meters (5,900 ft). 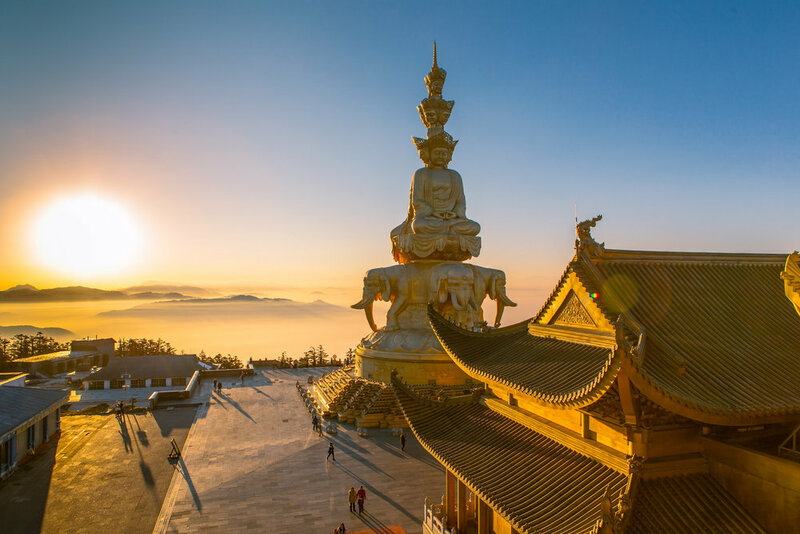 The area is well known for its scenery, sunsets, peculiarly-shaped granite peaks, Huangshan pine trees, hot springs, winter snow, and views of the clouds from above. Huangshan is a frequent subject of traditional Chinese paintings and literature, as well as modern photography. It is a UNESCO World Heritage Site, and one of China's major tourist destinations. 2. The Nine Dragon Waterfall is one of the three most famous waterfalls in Huangshan. 3. Li Bai (701–762) was a Chinese poet acclaimed from his own day to the present as a genius and romantic figure who took traditional poetic forms to new heights. He is regarded by many as the greatest poet in Chinese history. 4. Dream Flower Pen (Meng Bi Sheng Hua) is located within northeast of Yellow Mountain and close to the Bijia Peak. The elevation is 1,640 meters. A stone stands elevated with a round bottom cuspate top, like a brush pen used for calligraphy. Legend has it that once Li Bai dreamed that flowers blossomed on top of his brush. There is also another story that when Li Bai once visited Mount Huangshan, he was invited by a monk to write a poem. After he finished writing, everyone was so amazed by his calligraphy and poem. In his excitement (not without drinking some rice wine produced and provided by the monks), Li Bai threw away his brush which turned into a peak of Huangshan which is now called "夢筆生花Meng Bi Sheng Hua", or "Dream Flower Pen", meaning the brush blossomed in a dream. "Meng Bi Sheng Hua" also evolved into a Chinese idiom referring to very talented writers or writings. one of Three Sovereigns and Five Emperors in ancient China, living some 5000 years ago. He was believed to have succeeded in cultivation, become an immortal and rose to heaven on a dragon. Chinese people now call themselves "descendants of the Yellow Emperor". 6. Lotus Peak is one of the three main peaks of Huangshan. Buddhas are believed to sit on lotus petals (like a seat). 7. The Bright Peak is one of the three main peaks of Huangshan. 詩歌靈感來自張炳乾 （Benny Zhang Studio）以上攝影作品，照片攝於江蘇江寧. "Pear Blossom" was inspired by this photo taken in Jiangning, Jiangsu Province, China by Benny Zhang. * The Qingming or Ching Ming Festival, also known as Tomb-Sweeping Day in English, is a traditional Chinese festival on the first day of the fifth solar term of the traditional Chinese lunisolar calendar. This makes it the 15th day after the Spring Equinox, either 4 or 5 April in a given year. Other common translations include Chinese Memorial Day and Ancestors' Day. We move towards the moment of Time's birth. Within the massive gap of heaven … earth. Much like a song—but who will sing with me? Of Zi You gone, returned, now not with me. To trace plum blossoms at the edge of mind. They leave the worried world’s concerns behind. I could be in the presence of Ku Yi. Contented, all my thoughts flow with no helm. All I have is all I need to be. Ariel Tian, Art Director of White Cloud Poetry Society, at Central Park. Photo by Benny Zhang Studio. Spring snow at Central Park. Photo by Benny Zhang Studio. So little stays the same. My search as empty dreaming, lonely sorrow. So loneliness cannot be pushed away. On high is my heart’s home. The wind, my heavenly dome. Original poem Inspired by "The Mystical Udumbara" by Shen Yun Symphony Orchestra. Translated by Jennifer Zeng. Don't tell me how wonderful and colorful this world is! Yet alas! For what reasons do I sometimes hesitate?